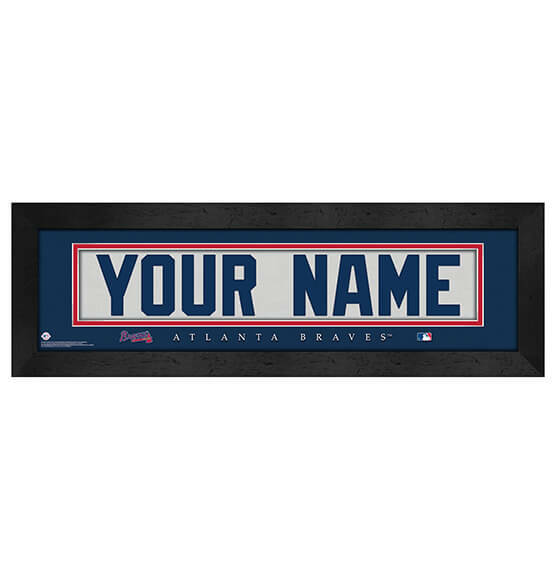 Whether they live in Braves Country or beyond, die-hard Atlanta Braves fans will cherish our Personalized Nameplate Framed Wall Art. Designed to look like the back of an Atlanta Braves jersey, this high-quality MLB sports decor features a sleek black frame and striking team colors. It's easy to customize: Just let us know what name you want featured on this custom wall art up to 12 characters. Whether you're purchasing this one-of-a-kind piece for yourself or for your favorite Atlanta Braves fan, you're guaranteed to hit a moon shot with this item!